Add this quick and tasty recipe to your stable of go-to weeknight meals. Toss the shrimp with 1 Tbs. of the olive oil in a medium bowl and the Cajun spice mix, making sure that the shrimp is evenly coated. Heat 1 Tbs. of the olive oil in a 12-inch skillet over medium-high heat until shimmering. Add half of the shrimp and cook until they start to turn bright pink, about 1 minute. Turn and cook on the other side for another 30 seconds, or until just cooked through. Transfer the shrimp to a plate and repeat with the remaining shrimp, adding more oil if necessary. Transfer the second batch of shrimp to the plate and reserve. Add the remaining 1 Tbs. oil to the skillet over medium heat. Add the onions and cook, stirring often, until they begin to brown, about 5 minutes. Add the wine and cook until the pan is dry, about 5 minutes. Add the tomatoes and garlic, and cook, stirring occasionally, for 10 more minutes. Add the shrimp and the cream to the sauce and heat through, being careful not to allow the sauce to boil. Meanwhile, bring a large pot of well-salted water to a boil. Cook the orzo according to package directions until al dente. Drain, reserving 1/2 cup of the cooking water. 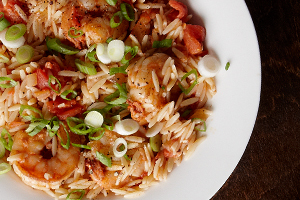 Toss the shrimp sauce with the orzo and transfer to a large shallow bowl. Add a little of the cooking water to loosen, if necessary. Top with the scallions and serve with hot sauce.